Weight: flying fox—3.3 pounds (1.5 kilograms); Kitti’s hog-nosed bat—0.053 ounces (1.4 grams), less than a penny! • Bats can be as large as a small dog or as small as a bumblebee. 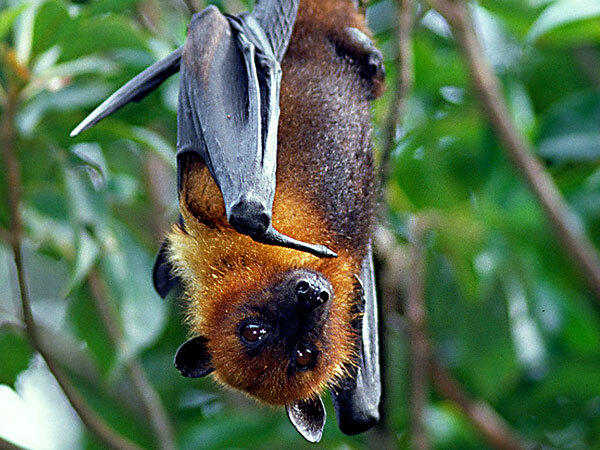 Largest – flying foxes with wingspan of up to 2 metres and weigh 1.5 kilograms and bumblebee bat weighing 2 grams. • Bats are the only group of mammals to exhibit true flight. • Bats are often clean animals and spent hours grooming. • Bats are not likely to attack people or pets. Bats are mammals belonging to the order Chiroptera, a name of Greek origin meaning "hand-wing," which accurately describes the animal's most unusual anatomical feature. Bats are the only flying mammals. Like all mammals, they suckle their young until they are fit and ready to forage for themselves. They have a thin, elastic wing membrane between their fingers and legs that gives them the acrobatic flight capacity. The scientific name for their wings is Chiroptera which translates to ‘hand wing’. 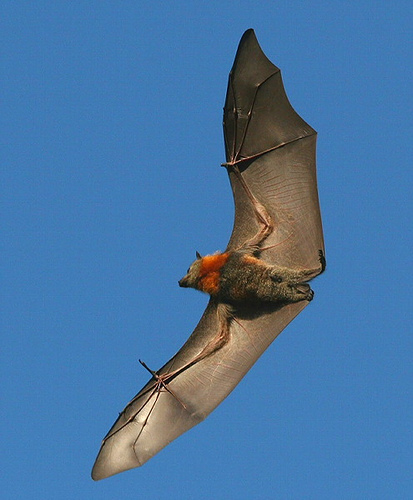 Such a ‘hand wing’ allows better maneuverability in flight and thus allows bats to be such remarkable flying mammals. Bats (except most fruit bats) orientate and hunt by means of a highly sophisticated system of echolocation, emitting high-frequency calls that beyond the range of the human ear. Most fruit bats, such as the Grey headed flying-fox, have larger eyes and a sharp sense of smell as they find food by sight and smell. Echolocation helps bats avoid collisions and help locate their prey as calls bounce off obstacles or prey. They make calls as they fly and listen to the returning echoes to build up a sonic map. Bats are sophisticated hunters and some bats can even distinguish between different insect species by their wing-beat frequency. Bats have a low reproduction rate and a long life expectancy – one baby per year and can live up to 30 years. They are warm blooded animals with the ability to regulate their body temperature and are also able to maintain their energy efficiency by reducing their body metabolism. The order is divided into two suborders, the Megachiroptera, consisting of a single family, the flying foxes and their Old World fruit and flower eating relatives, and the Microchiroptera, composed of the rest of the bat families, some 17 in all. These families are further classified into about 180 genera and over 1,100 species; only rodents have a greater number of species. Even though the names imply otherwise, not all Megabats are larger than Microbats. Although it is true that certain species of flying foxes have wingspans of up to 5 feet, one member of the Megachiroptera, the flower-feeding Macroglosus, has a wingspan of only 10 inches. However, some of the Microchiroptera are very tiny; the smallest is probably the Philippine bamboo bat, Tylonycteris pachypus, its forearm measuring only 22mm. and weighing only 0.05 ounce. 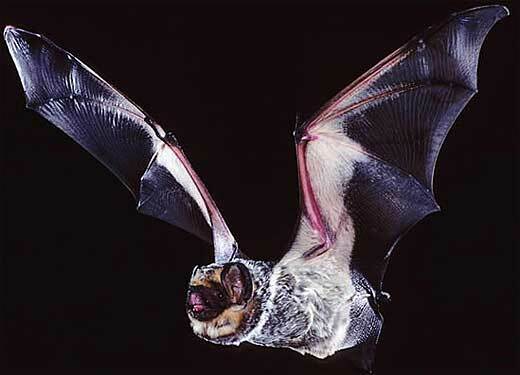 The largest Microbat is the tropical American false vampire, Vampyrum spectrum, with a wingspan of up to 40 inches. Megabats and microbats are different in many ways. Megabats have large eyes and often dog-like faces; microbats have small eyes and often have elaborate facial structures. Microbats use echolocation to detect their prey while megabats rely on smell and vision to find food. However, the Egyptian fruit bat (pictured left), which is a megabat, also uses a form of echolocation. Megabats feed almost exclusively on fruit and flowers, while microbats have more varied tastes, eating insects, fruit, pollen, nectar, fish, frogs, other bats and blood. Because bats are small, secretive, feed at night, and are unfamiliar to most people, they are sometimes regarded as rare. On the contrary, they are found throughout the world except for certain oceanic islands, the Arctic and Antarctic. Though most species inhabit the tropical and semitropical areas of the world, they are still common in the United States and are most numerous in the Southwest. Sone bats prefer to roost in barns, attics, caves or abandoned mines, those shelters providing safety from predators, protection from fluctuations in weather, and seclusion for rearing the young. Other species select hollow trees or rock crevices as their daytime resting site, while certain ones are known to roost in exposed locations, clinging to tree trunks or hanging upside down from tree branches. 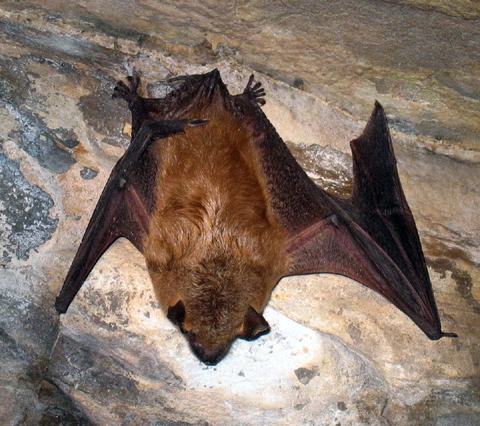 To survive in colder regions, bats either hibernate in shelters with high humidity and temperatures above freezing, or migrate to warmer areas where food is available. Bats serve as important pollinators of many food plants as well as provide useful aids for medical research, particulary for the blind. Bats are the only major predator of night-flying insects. Bat prey includes lacewings, cockroaches, gnats, and mosquitos as their major food source. 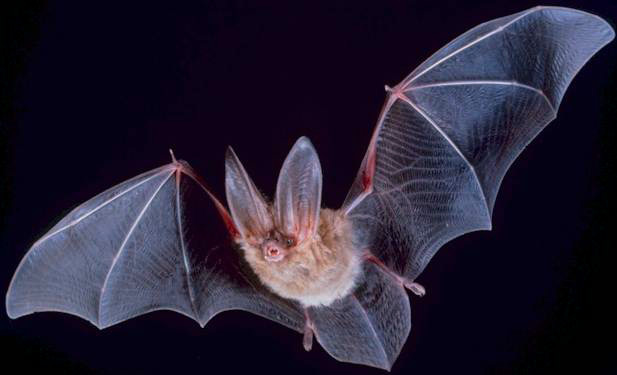 A single Big brown bat can eat between 3,000 and 7,000 mosquitos in a night, with large populations of bats consuming thousands of tons of potentially harmful forest and agricultural pests annually. • Female bats choose somewhere warm to gather in a maternity roost for a few weeks in summer. They have their babies there and nurture them until they are able to fly and feed themselves. • Bats mate during the autumn and sometimes into the winter with females storing the sperms and conceiving in spring when the weather is a little warmer. • Bats are very sensitive to disturbance during the maternity season and may abandon their young if this happens. Babies are suckled by their mothers till they are old enough to fly and they begin to venture out from the roost to forage for food. • Bats are numerous in the tropics; Indonesia with 175 species, Venezuela with 154 species and Mexico with 137 species. Central and South America are home to almost one third of the world’s bats. • Many bat species that occur on islands are found nowhere else in the world and in some places bats are the only native mammals. • Caves provide shelter for bats. 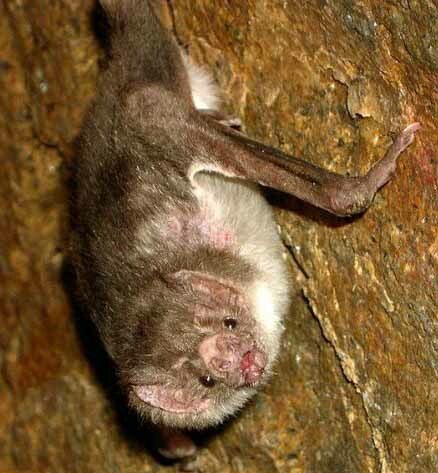 In temperate areas, bats use caves as breeding sites in summer and hibernation sites in winter. Although bats don’t need to hibernate in the tropics, caves are still important. 70% of bats consume insects. There are also fruit-eating bats; nectar-eating bats; carnivorous bats that prey on small mammals, birds, lizards and frogs; fish-eating bats; and the blood-sucking vampire bats of South America. Bats can be found almost anywhere in the world except the polar regions and extreme deserts. • Bats are important pollinators in the tropical forests where some plants flower only at night to attract bats. • Chewing gum, tequila and sisal are three products of many which come from plants that at least partly rely on bats for pollination or seed dispersal. • They help control pests as some bats eat half their weight in insects in one night. • Vampire bats are small – 7cm to 9cm and take approximately a tablespoon of blood each night. • Vampire bats are colony orientated with caring for those who cannot feed by regurgitating blood they have collected. • Stroke victims are said to benefit from studies of a clot-dissolving substance in the vampire bats’ saliva.